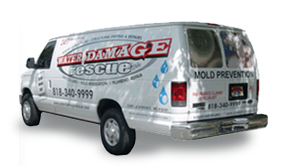 Water Damage Rescue is available 24/7 with a licensed and certified water damage technician available to you immediately. We provide home owners and business owners with emergency water damage services covering a range of flood damage emergencies. 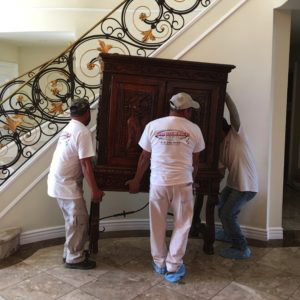 We believe in providing quality, courteous and professional services to return your home or business back to its pre-loss condition. We handle everything from water extraction, structural drying and cleanup, to rebuilding. Our techs are fully equipped when they arrive to provide water removal and cleanup, no matter how large or how small. They are very understanding of the inconvenience you are experiencing and are experts at handling the water damage restoration process as quickly as possible. You can expect our technicians to be knowledgeable, kind and courteous from start to finish. We come in and extract the water from the structure or business. Then we dry down the structure, or building. Once it is dry we will clean it up and fix it. We take care of all of the contents that are in the building. We do content restoration as well as protection and moving. It usually takes us a couple of days to fully do the job, but every job is different. 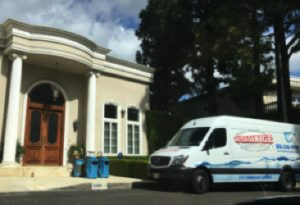 We are a water damage restoration company in Los Angeles CA providing service 24/7, day or night. We do all the repairs needed for any type of water damage Los Angeles CA, including broken, frozen and leaky pipes, leaky air conditioning units, toilet and sink overflow, appliances such as dishwasher, water heater, and washing machine malfunction, as well as storm damage. We also do complete carpet and hardwood floor drying in your home or basement. We can do sewage damage cleanup and sewer removal as well. Once the building is dry, we handle all of the construction. We will do the drywall repair, painting, flooring replacements, and any other repair that needs to be done. We will also do all of the cleanup, repairs and content restoration for fire damaged homes. Once we repair all the damages we inspect everything and get permits to make sure its correct. We will get the inspector to come out so that the customer doesn’t have to deal with that. We also work with all the insurance companies. We work with an insurance company program. We go to the job and bill the insurance company for the emergency service, and not the customer. Our team also specializes in Los Angeles sewage damage cleanup to keep you and your loved ones safe. Sewage damage can contain high amounts of harmful bacteria and there are serious health risks associated with it. It’s important that you do not try to clean up a mess from broken pipes that are connected to a sewage line. Coming in contact with raw sewage can cause disease, can destroy your valuables and cause severe damage to your property. Only trained professionals with the right equipment should handle sewage removal. Our Certified Restoration Specialists are trained to clean, disinfect, and sanitize your property’s sewage damage, minimizing the risk of health hazards or further damage. We can remove, repair, replace, or remodel the affected areas of your home or business. We understand the need for efficient, hassle-free restoration after a sewage catastrophe. We handle all residential and commercial water damage problems. If you have an emergency water damage problem because of some sort flooding or sewage, be sure to call our water damage company and we will send a specialist out right away to help with the water cleanup and removal. 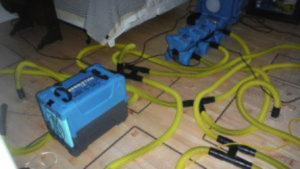 “The Water Damage Rescue team is truly exceptional. As soon as I called them, they came about 30 minutes later. They removed all the water sitting on my floor, dropped off some drying machines, and less than a week later my house was dry. They redid the carpet and hardwood floors, and I couldn’t have asked for a better job. The team is professional, truthful, and deal directly with the insurance so I didn’t have to worry about the bill.” –Omer B. Don't let your insurance company dictate the rules of the game. Let Us collect what you truly deserve for you now. From water removal to reconstruction, we do it all.